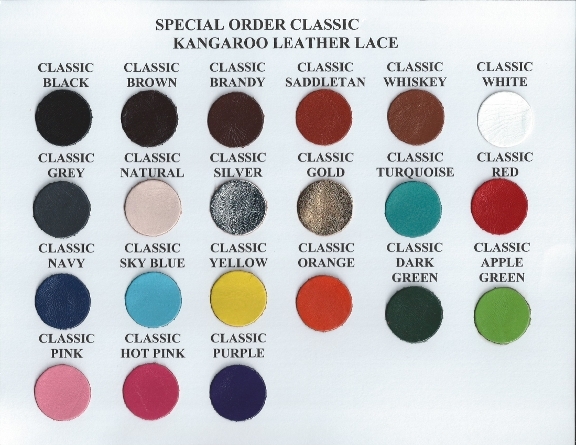 Looking for kangaroo leather lace in just the right shade for your model horse tack, leather braiding, or dog leash braiding projects? Look no further! I can special order in the following leather colors & types by full lace spool or by hide. See FAQ below. What colors and types does the lace come in? What is the price for the lace and hides? Can this lace be shipped Internationally? What widths does the leather lace come in? What thickness is the leather lace? What size spools does the lace come in? Is the lace drum stuffed? Will the dye in the Black Lace run? How often does The Unicorn Woman place lace orders? Can whole Kangaroo Hides be purchased in these colors, too? My supplier offers over 30 different colors/types of Kangaroo Lace. Scroll down for colors and descriptions of the various types. Classic Lace is a "full grain finish giving a shiny polished look." For most model horse tack applications, this is my favorite lace. L.H.G. Lace is "cut as a straight lace from drum dyed skins with ironed finish. It can be re-stained, waxed, or polished to enhance color." The stuff I have of this is very pliable and can be tooled. However, the color is very dull and does need some enhancing, unless you're into the primitive look. Metallic Foil Kangaroo Leather Laces have a metallic foil applied to the top of the leather. They are currently available in gold & silver. Glazed Lace is "tanned from larger skins to give more pronounced grain, a top finish has not been applied allowing the user to apply waxes, oils, or leave as natural." *Due to the width of the 1/4", it comes on a 25 yard spool. Note for April 15,2014: Kangaroo Leather prices are volitile, depending on climate conditions in Australia, fuel prices for shipping, the current currency exchange rates between Australia and America, etc. The prices below are the current prices, but may be changed without notice. YES! When you purchase 10+ spools, you will receive a discount of 10% off the price of each spool. You may mix and match colors/widths to receive this discount. No, not from me. Kangaroo is an Internationally Regulated item that requires a special license from USFW to import and export. It also requires a special inspection for each shipment. Both of these items have very steep fees. Since none of my international customers were willing to pay such fees, I have now dropped the license and only sell to the USA. Sorry. Lace can be ordered in widths from 2.5 to 10 mm. That's approximately from 1/16" to 1/4". 1/16, 3/32, 1/8, 3/16, & 1/4, are the typical widths I deal with. 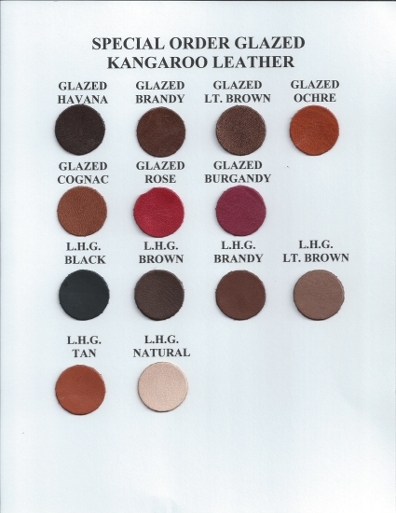 Round lace is not available in Kangaroo Leather. My manufacturer does not give a measurement on this, just describing it as thicker or thinner. Sorry. A spot check of the laces gives me a figure of 1 - 1.5 mm, but this is an approximate figure done just with my eyes. It does vary slightly between lots. Most spools are 50 YARDS, not 25 yards at most other retailers. If you double their price, you'll see you are getting a savings by buying more from The Unicorn Woman. 1/4" Lace is a 25 yard spool. Beveling is done on the 3/32". 1/8", & 3/16". The beveller machine is not producing as sharp a bevel at the moment, so the supplier is also pressure rolling the lacing to give it that nice curved look. This may change if the supplier gets a new machine. for current status on this. Yes, all the customer order lace and kangaroo hides are drum stuffed, vegetable tanned leather. The supplier says: "The Black Classic lacing has been drum dyed, pigmented then sealed and yes that would stop it from running as such but most plaiters put creams or oils into the leather which would in the long run do the same thing, although it would have to be re-applied." That depends on width and color. That depends. I carry about 50 types of lace currently in stock. Usually, I sell this by the yard to model horse hobbyists that use it to make scale-miniature tack. If you only need a few yards, you might check my in-stock listing in the Catalog--Supplies section. If the color/width is not listed on the website, then the minimum amount is one full 50 yard spool/color and width. If you only need a few yards of an in-stock color from the Catalog--Supplies section, follow the normal Ordering instructions. If you wish to order full spools, to be placed on the notification list for when I place the next order or to check to see if I happen to have what you need in-stock. See How often does The Unicorn Woman place lace orders? for details on ordering frequency. If you have any other questions, feel free to . This web site is Copyright 1999-2015 Melody D. Snow. All rights reserved.